Puffer Beanie Hat is universal beanie for babies, girls and adults! I use soft, 100% organic cotton grown and spun without the use of pesticides, herbicides or other chemicals. This is awesome birthday gift. times by different crocheters. However, please contact me if you have ANY questions. I will happily provide email support for any of my patterns. *** All rights to this pattern are owned by Daisies Crochet. No part of this pattern or photo may be sold, shared, reproduced, photocopied, or transmitted mechanically, electronically or by any other means.This pattern is for personal use only. Please do not sell items made from this pattern. Thank you for understanding! Puffer Scarf is universal neckwarmer for girls and adults! I use soft, 100% organic cotton grown and spun without the use of pesticides, herbicides or other chemicals. This is awesome Christmas or birthday gift. 10 pages, 19 photos. 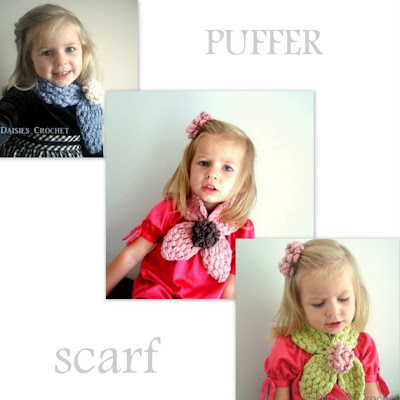 Puff stitch photo tutorial. FPDC, BPDC photo tutorial. Flower pattern is included.